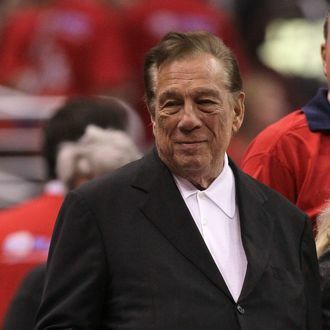 People who want to learn more about Donald Sterling’s racist views are in luck. Deadspin has obtained what seems to be a longer version of the conversation between the Clippers owner and his girlfriend, V. Stiviano, that was posted by TMZ earlier this weekend. For those just catching up: The original recording features Sterling berating Stiviano for posting a photo of herself and Magic Johnson to Instagram, which causes him to go on a rant about what he sees as her unacceptable “broadcasting” of her “[association] with black people.” In Deadspin’s tape, Sterling tells Stiviano (who is of black and Mexican descent) not to bring any black people to Clippers’ games. She then points out that much of the team is, in fact, black. His response? You just, do I know? I support them and give them food, and clothes, and cars, and houses. Who gives it to them? Does someone else give it to them? Do I know that I have—Who makes the game? Do I make the game, or do they make the game? Is there 30 owners, that created the league? Of course, it doesn’t end there. There’s more arguing about who Stiviano can have on her Instagram feed (she explains that she thought an image of baseball player Matt Kemp would be alright with Sterling because “He’s lighter and whiter than me.”) At one point, Sterling confusingly tries to justify his ugly perspective by claiming that, “You go to Israel, the blacks are just treated like dogs.” When Stiviano compares Sterling’s ideas about black people to the discrimination Jews endured during the Holocaust, he says, “There’s no racism here. If you don’t want to be … walking … into a basketball game with a certain … person, is that racism?” Yes. The whole thing can be listened to at Deadspin.